The holidays were right around the corner and I wanted to create a signature holiday cookie for my recipe collection, but I was stumped. Should I use egg nog? Cinnamon? Chestnuts? I had no idea where to begin, until my boyfriend surprised me with some peppermint bark one day and a light bulb went off. Peppermint bark is one of those wonderfully delicious treats that can only be found around Christmas time, so it must be the perfect star ingredient for a very special holiday cookie, right? I was determined to find out, so I ran to the grocery store, bought 10 bars and began my journey. Two hours and some homemade vanilla extract later I had my signature holiday cookie! A cool, refreshing, delightful indulgence paired with semi-sweet chocolate. These cookies taste like a cross between a peppermint patty and a chocolate chip cookie. Oh so yummy! Thumbs up for the inspiration! Preheat oven to 350F degrees and line cookie sheets with parchment paper. Cream butter and sugars in a stand mixer or hand mixer on medium speed until smooth (about a minute). Add the egg and mix for a few seconds until thoroughly blended then add the vanilla extract*. Sift the flour, baking powder and salt together and add to the butter mixture. Then slowly mix in the chopped up peppermint bark until thoroughly blended. Use a small cookie scoop to scoop cookie dough onto the cookie sheets, leaving at least 2 inches of space between each cookie, because they will spread! Bake 8-9 minutes on the top rack of the oven. The cookies will be very soft when they first come out, let them cool about 5 minutes on the cookie sheets then remove and place the cookies onto a cooling rack and bring to room temperature. Meanwhile, in a microwaveable bowl, melt semi-sweet chocolate in 15 second intervals until smooth. Be careful to not burn the chocolate. 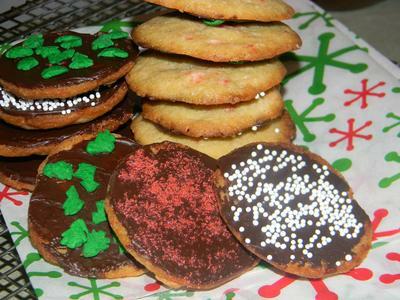 Using an angled spatula or butter knife spread a very thin layer of melted chocolate onto the bottom of the cookie and sprinkle with assorted sprinkles (I used white nonpareils, red colored sugar and Christmas trees). As soon as all of the cookies have chocolate on them put them into the freezer for 10 minutes, this will set the chocolate so it won’t smudge. *This recipe calls for homemade vanilla extract. Store bought vanilla extract is fine but homemade is just a little extra special and very easy to make. Use 1 vanilla bean per every ounce of liquor. The vanilla extract in this recipe was made with Brandy. Brandy compliments both peppermint and chocolate. Scrape the seeds from the vanilla beans and insert both the seeds and the pod of the vanilla beans into the bottle of liquor. Keep in a dark, cool place and shake vigorously every few days. You can begin using the extract after 2 months but it is best after 6 months. After 6 months strain the extract and discard the solids. Vanilla extract lasts forever!!! Like a fine wine, it only gets better with age.